To get a real Singaporean feel, cook this on a barbecue outside, where the sweet-smelling smoke can really spike your appetite. The cucumber and crisp iceberg lettuce are not just for decoration: they provide a cooling contrast to the spicy beef and rich satay sauce. Soak 16 bamboo skewers in water for 30 minutes to prevent burning. Lay the beef on a board, cover with clingfilm and lightly bash with a rolling pin to flatten and tenderise. Mix the soy sauce, oil, lime juice, spices, garlic and a pinch of salt; coat the beef in it. If you have time, leave it to marinate for an hour or so. Heat a griddle pan or barbecue until hot. Thread the beef slices onto skewers and cook for 2 minutes on each side, until golden round the edges and just cooked through. Warm the satay sauce. 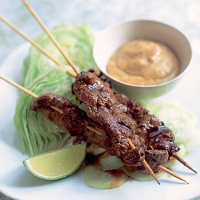 Serve the skewers on beds of cucumber, with the lettuce, lime wedges and individual bowls of satay sauce. This recipe was first published in Fri Jun 01 01:00:00 BST 2007.